Real Money: Money and Payment Systems from an Islamic Perspective is a new anthology from the IIUM Press, Malaysia. Edited by Professor Ahamed Kameel Mydin Meera of the International Islamic University Malaysia (IIUM), this book contains contributions from several authors including yours truly. My chapter titled, The End of Money and the Liberation of Exchange, is essentially a transcript of the presentation I gave at the 2007 Gold Dinar Conference in Kuala Lumpur. In it, I outlined the basic framework for a global credit clearing network that utilizes no national currencies as payment media and no political currency unit as a value measure. 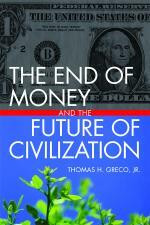 As I did in my first book, Money and Debt: A Solution to the Global Crisis, I argued that the various functions that money is supposed to serve—medium of exchange, measure of value, and store of value—can and must be segregated, and described a global payment system based on direct credit clearing, using an objective, concretely defined measure of value, like the gold Dinar, silver dirham, or some composite commodity standard. I outlined how this Shari’ah compliant approach could provide inflation-free accounting, achieve full employment, reduce the need for foreign exchange reserves, eliminate exchange rate risks, and provide more equitable trading relations among all the peoples of the world. This entry was posted in Developing Alternatives, Exchange Design, My activities and tagged credit clearing, Gold Dinar. Bookmark the permalink. would taxing and spending in real money be better or worse than taxing and spending in the current form of non-real money??? the national currencies?? when islamic govts , to the extent that they do tax, would they tax in real money and spend in real money too?? currencies being non real money here?? so real money would be a dictate from allah?? would other on islamic market s differ? ?